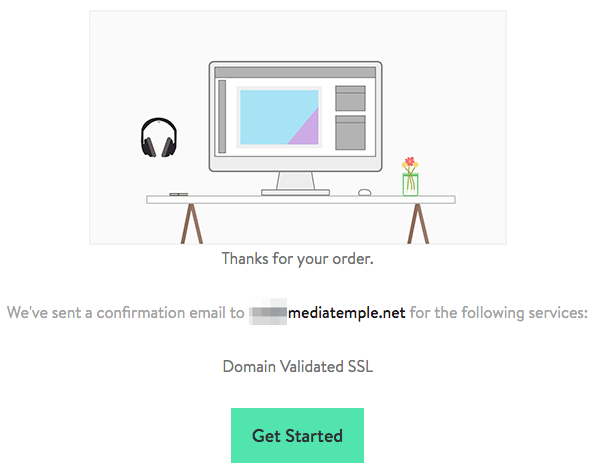 Follow these instructions to order an SSL Certificate from (mt) Media Temple. (mt) Media Temple utilizes Domain Validated SSL certificates from a third-party provider. 1. Log into your Account Center. 2. 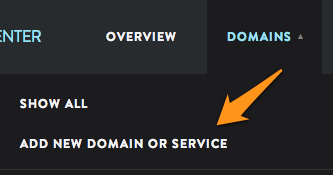 Click Domains from the menu at the top of the screen and select Add New Domain or Service. 3. Scroll down to the Add-On Services section, and click Activate next to SSL Certificate. 4. Confirm that your shopping cart has the correct items in it and click Checkout. 5. Select your previously stored payment method or enter new payment information. Once this is complete, review and agree to the terms of service and click Place Your Order. This will complete the purchase of your SSL. 1. Your next steps are to add the domain's contact info, verify, and install. To begin this process, navigate to the Account Center and scroll down to Add-On Services. Click the Manage button next to your newly purchased SSL. 2. Fill in the "Common name" with the domain name you wish to secure. If you are securing a domain such as www.example.com, please type your domain name in the box without the "www." prefix. Our SSL certificates will protect both the domain and the www. subdomain. If you would like to protect a specific subdomain such as secure.example.com, then you will need to enter the exact subdomain that you will be using with your new SSL certificate. Please be aware that the free Secure Site Seal will only show up for the exact domain name for which the SSL certificate was purchased. 3. Now we need to obtain contact information to be submitted to the SSL provider. Next, you will need to select a contact to act as owner of the SSL or enter the certificate owner's contact information. Then, click Continue. Once you have submitted the information for your SSL, verification will be required. There are four ways you will be able to verify ownership of the domain you are trying to secure. The domain validation only needs to be approved by ONE of these methods. This method can be utilized if the DNS for the domain to be secured is hosted with Media Temple (i.e. your domain's name servers are pointed to ns1.mediatemple.net and ns2.mediatemple.net and associated with your account). After filling out your SSL information, you will be presented with an AUTO-VERIFICATION button which can be clicked on to verify the SSL. An email link will be sent to those addresses which can be clicked on to validate the SSL. This method can be utilized if you have file access to your domain's web hosting. When an SSL order is placed, an email with a unique ID will be sent to your Media Temple Primary Email Address. Take the unique ID, and navigate to your domain’s root directory. Copy only your unique ID, and place it inside the godaddy.html file. That’s it! However, you may need to wait a bit of time for the verification to finish processing. Your godaddy.html file MUST be placed on the subdomain. For example if you have an SSL for blog.example.com, you will want to put the godaddy.html file on blog.example.com/.well-known/pki-validation/godaddy.html and NOT example.com/.well-known/pki-validation/godaddy.html. This method utilizes your zone files. To complete this, you will need to log into the account where your domain's nameservers are pointed. To see this information, you can perform a simple WHOIS lookup. For instructions, see this article. For record type select "TXT". If your zone files are managed at Media Temple, leave the subdomain field blank. Other hosts may require you to use an '@' in the subdomain field. For the value following the subdomain, enter your Unique ID. The unique code MUST be entered on the ROOT domain. For example even if you have an SSL for shop.example.com, you will want to put the TXT record on example.com and NOT shop.example.com. Once this has been completed, save the file. Please keep in mind that verification could take up to 24 hours to complete. It is unlikely that verification will take 24 hours, but it can occur and is part of the normal verification process. You should also receive a second confirmation email once the certificate has been issued. Return to the Overview page in the Account Center once you have verified your contact information and click on the Manage button for your SSL Certificate. If you are ordering for most of our hosting services, we are able to automatically install the SSL certificate onto the server. To do this, select which service you wish to apply the certificate to and click Install. If you are ordering for a DV Developer or (ve) server, or you do not want us to automatically, you will want to refer to the installing an SSL Certificate for instructions to manually install your SSL Certificate.